As we close out 2015 and head into 2016, we reflect back on a great year. We welcomed new clients and reconnected with former ones, and enjoyed working on some new and challenging projects around the world. Check out our year in review! We are wishing you a very happy and prosperous New Year! This entry was posted in General News and tagged adg lighting, custom lighting, los angeles lighting on December 30, 2015 by @dl1ght. Back in 2013, ADG Lighting had the privilege of designing and fabricating custom lighting on a custom home being re-built on the Irvine Terrace Bluff in Corona del Mar, a beautiful neighborhood located in Orange County, California. With views of Balboa Island, Newport Harbor, and Catalina Island, this 6,200 square foot estate was everything you could imagine in a coastal luxury estate. Currently on the market for $15.5 million by Tim Smith of Coldwell Banker Previews International, the immaculate coastal estate owned by ex-Angels outfielder Gary Matthews Jr. was created by architect Carlton Graham of Graham Architecture and built by Steve Davidson Construction and Tom Waters. The home was designed in collaboration with Michael Fullen Design Group. Custom lighting is key to the unique value of a home. If you just pick decorative sconces, pendants and lanterns out of a catalog then they are no different than the house next door. But truly inspired projects that yield high dollars have custom lighting fabricators like ADG Lighting that work directly with the architects and designers. The team of industrial designers, architectural designers and fabricators under the direction of Gerald Olesker have worked with Michael Fullen for many years. Carlton Graham is currently working with Olesker on several other spec homes in Newport Bay. Lighting Designer Rosemarie Allure has known the team from ADG for 18 years and collaborates as needed with fabricators alike. To get this custom ceiling light just right in the kitchen, the team looked at Mondrian paintings and evaluated the size and volume of the space. Looking at the kitchen island and finishes, ADG worked with Michael Fullen Designs to create a custom coco bronze. Boasting four bedrooms and five bathrooms, the property sits on a third of an acre. You can view the custom light fixtures (including the custom designed room filled with mementos from Matthews’ baseball career) throughout the home designed and manufactured by ADG Lighting. Read more about the property in 20/Twenty Architectural & Beyond Magazine. This entry was posted in Featured Projects, Newport Beach, Real Estate and tagged 1231 dolphin terrace, adg lighting, Corona del Mar, custom lighting newport beach, gary matthews jr on December 22, 2015 by @dl1ght. Some major creative juices were flowing the day we began working on this expansive Los Angeles home with renowned architect Hagy Belzberg of Belzberg Architects and Delta Wright Interior Design. Recently featured in Interior Design magazine, the 12,000 square foot avant-garde home provides some major eye candy for anyone who enjoys original and unique design. ADG designed and custom manufactured several fixtures and furnishings in the property, including a custom vintage glass orb chandelier, a custom pool table cue wall rack, and a round glass pendant. View more of our custom design work. For more information please call (818) 597-9494 or email info@adgmail.com. This entry was posted in Iron Work, Lighting, Los Angeles, Press and tagged billiards table, blown glass, Brentwood, chandelier, custom metal work, custom pool cue, custom pool table cue wall rack, custom vintage glass orb chandelier, interior design magazine, made in usa, metal work, water jet cut on December 16, 2015 by @dl1ght. Hot off the press! One of ADG’s premier fixtures was just featured in the Dering Hall Journal as part of their 10 Show-Stopping Glass Chandeliers. We were featured as a top artisan. Our Floral Murano Glass Chandelier, artfully custom designed and manufactured by the team at ADG Lighting, makes the perfect focus piece for any dining or living space. Our custom chandeliers have been making the rounds lately; our 93″ vintage floating ring chandelier can be seen at the newly renovated Four Diamond Delafield Hotel in Wisconsin. 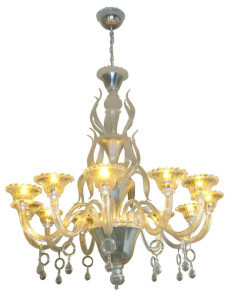 We have a number of other styles of chandeliers on our website, from traditional to modern. Interested in learning more about our custom chandeliers? Give us a call at (818) 597-9494 or email info@adgmail.com. This entry was posted in Dering Hall, General News, Lighting, Press and tagged adg lighting, custom chandeliers, dering hall, floral murano glass chandelier, glass chandeliers on December 9, 2015 by @dl1ght. Los Angeles – December 2, 2015 – Four Diamond boutique hotel Delafield Hotel has enlisted the expertise of leading Los Angeles based firm ADG Lighting for the renovation of their grand ballroom. Design firm Paper Dolls Interiors has developed a key relationship with ADG to design and develop the decorative lighting for the hotel. ADG Lighting has been tasked with the custom design, manufacturing, and engineering of a floating ring chandelier, measuring 93 inches in diameter. A series of the chandeliers will be placed in the grand ballroom, a spacious area featuring rich cherry columns. “We are thrilled at the opportunity to work on one of the best hotels in Wisconsin,” said Gerald Olesker, CEO and founder of ADG Lighting. “The vintage beauty of the property is undeniable. From putting pen to paper and developing the concept for the chandelier, to the engineering and manufacture of the fixtures, the process has been both exciting and inspiring,” he said. With ADG’s expertise in manufacturing antique style pieces and fixtures, the entire project has been custom designed and led by Olesker, who has been the artistic vision behind some of the world’s most recognized and notable hotels and properties. His client roster includes the MGM Grand Las Vegas, Bellagio, Four Seasons Hotel Bahrain Bay, Oceana Hotel, the SLS Hotel South Beach and the Manhattan Country Club. His team is also behind the current remodel for the City of Beverly Hills Gateway, as well as several other major projects. “Creating functional detail through decorative lighting and architectural ornamentation is our signature work, and is sought after by many of our clients,” said Olesker. The Delafield Hotel has been named as one of the Best Hotels in Wisconsin by U.S. News Reports in 2013 and 2012, selected as Inn of the Month by Country Living, and featured in publications such as Luxury Living, CS (Chicago Social), Exclusively Yours and Madison Magazine. ADG Lighting, a subsidiary of Architectural Detail Group, is a custom design and manufacturing firm specializing in high-end residential and commercial spaces. Based in Agoura Hills, the company works with restaurants, hotels & resorts, and landmarks worldwide providing high caliber design and sustainable lighting solutions. This entry was posted in General News, Hospitality, Interviews, Los Angeles and tagged Beverly hills, delafield hotel, hospitality lighting, lighting manufacturing, ring chandelier on December 2, 2015 by @dl1ght.